Mumbai: State Bank of India (SBI) expects to recover half of the assets that turned sour in the initial 12 large bad loan accounts that were identified for bankruptcy resolution, chairman Rajnish Kumar said. “The recoveries will be around 50% and most banks are holding provisions in excess of 50%. It may differ from bank to bank, but at SBI, our estimate is that we will be able to write back part of the provisions if everything goes well," Kumar said in an interview on Tuesday at Mint’s Mumbai office. Barring one, all the accounts are in various stages of resolution at different benches of the National Company Law Tribunal (NCLT). At the time of referring these high-value non-performing assets (NPAs) to the insolvency court—the new platform that India created following the Insolvency and Bankruptcy Code (IBC) being put in place in May 2016 —they accounted for 25% of then ₹ 8 trillion bad assets in the Indian banking system. Since then, the pile of bad assets has swelled to ₹ 10.3 trillion as of 31 March. For the 28 bad accounts that were subsequently identified by the Reserve Bank of India for resolution, Kumar expects the recoveries to be less—in the range of 30-35%. Even then, SBI will be able to write back some provisions as it has already set aside money to cover 76% of these NPAs. This will, in turn, add to its profit. 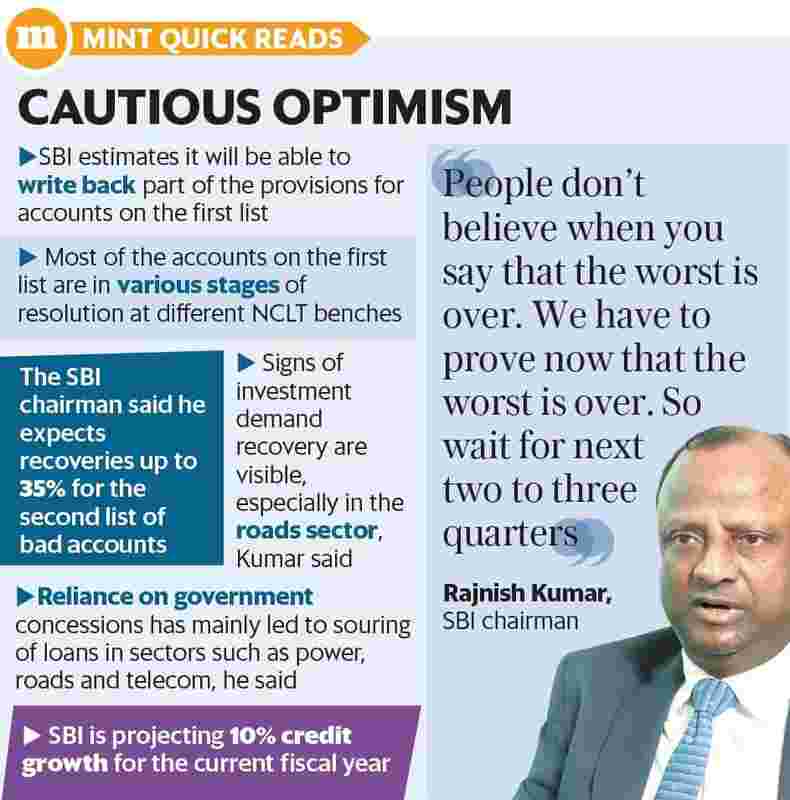 Unlike a few of his predecessors at SBI who had promised time and again that the “worst is over" on the bad loans front—and such statements were typically followed by a further expansion of bad assets—Kumar is cautious in commenting on the state of NPAs at the nation’s largest bank. “People don’t believe when you say that the worst is over. We have to prove now that the worst is over. So wait for next two-three quarters," he said. According to him, the bad loan recognition process is over and NPAs peaked in March 2018; every year, the banking system will add fresh NPAs, but they will be “within the tolerance level". The current credit cost will also be “within the tolerance level and will progressively reduce", he added. He is also seeing signs of investment demand recovery. “I don’t have (a) pipeline of investments in (the) private sector. But there is huge investment happening in the roads sector," he said. SBI is projecting a 10% credit growth for FY19 and is looking for a mix of 60% retail assets and 40% corporate assets. Till 6 July, there has been a 12.8% credit growth for the industry, against 5.7% in the year-ago period. Over dependence on government regulations and under-recoveries from end-consumers are the chief reasons for the massive debt pile-up in India’s “regulated" sectors, said Kumar. The RBI’s financial stability report in June—a biannual health card of India’s financial system—has projected gross NPAs of the industry crossing 12% or, in the worst-case scenario, 13% by March 2019, from a little over 11% in March 2018. According to Kumar, reliance on government concessions in highly regulated sectors such as power, roads and telecom has mainly led to the souring of loans. At the same time, he also held his own community responsible, citing poor underwriting and risk management by bankers. “We cannot have over-leveraging in the system any more. The appraisal and underwriting standards are undergoing a huge change. But there is a greater realization about payment discipline as well as the equity from promoters," he said. “For regulated sectors, I would say external factors are 70% responsible for the bad loans and internal factors (banks’ inability to appreciate risks) 30%. For other sectors, it would be 50:50," he said. Citing the example of the power sector, Kumar said that even though there had been attempts to turn around power distribution companies, things did not work “as expected". He added that power sector firms are likely to grapple with severe “cash flow issues" once admitted for insolvency proceedings, as their power purchase and fuel supply agreements are likely to be terminated on being declared insolvent. That is why, he said, the lenders are trying to resolve a few power sector assets outside NCLT. According to recently available data, NPAs in India’s power sector stood at ₹ 37,941 crore. Commenting on the suitability of IBC across sectors and assets, Kumar said that for certain sectors, “it should be left to the commercial decision of lenders on what approach they want to take". For distressed firms in the engineering, procurement and construction sectors, he suggested an arrangement with the existing borrowers can be explored to complete the projects and derive a certain value as the underlying assets in the sector are not great. “IBC is one of the most significant reforms that has been carried out by the government," he added.